This is the perfect choice for those who want to find out more about Reiki and the benefits it can offer, from a highly qualified and experienced Reiki Master. Published in paperback and Kindle editions in the UK by Piatkus, and in the USA by Tarcher/Penguin, 300 pages. Part 1 : What Is Reiki? 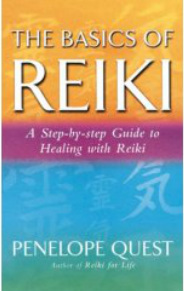 The American edition of "The Basics of Reiki" was published in December 2012 by Tarcher/Penguin. It has exactly the same content, including illustrations, as the UK edition described above, but with Americanised spellings and a different cover.